Rating: 5 Out of 5 Stars Aligned….Uh oh! Your tentacled friend has gone missing. What can you do? Go looking for him of course! Travel from the deepest cellars to the highest spires of a sprawling mansion. Search the grounds from the forest to the lake. On the way you’ll meet monsters and demigods, aliens and Old Ones, and all manner of other creatures from the Cthulhu mythos. Surely something, somewhere, has seen your shoggoth? An affectionate homage to the works of H.P. 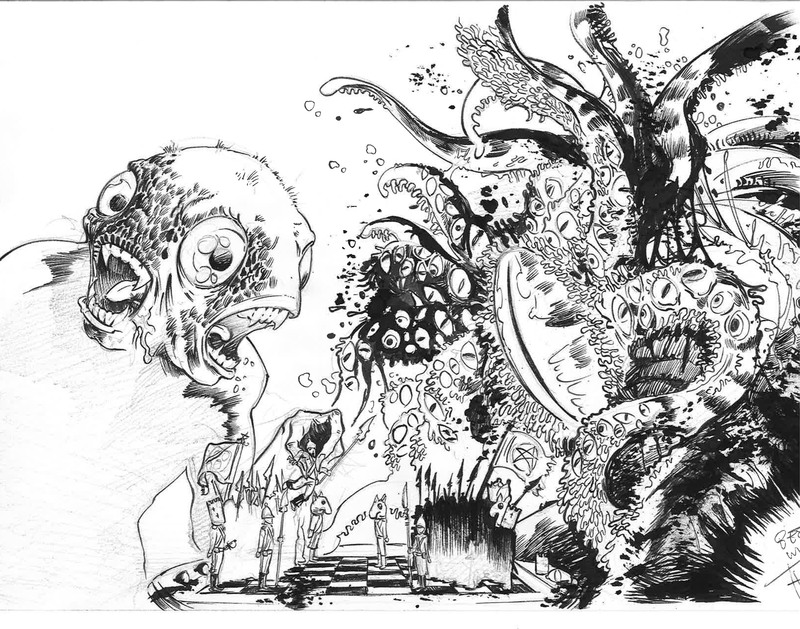 Lovecraft, beautifully illustrated by Adam Bolton, and rhymes by Ian Thomas. For mythos dabblers and shoggoth owners of all ages. Back in June I posted an update on this project by Ian Thomas and Adam Bolton, and mentioned a contest they had to see if anyone could guess where the Shoggoth was. Turns out I won with the best answer which earned me a signed copy of Where’s My Shoggoth? , and a canvas print of a double-page spread of my choice from the book. I first learned of this book in September of 2011, when researching a new wave of Lovecraftian Children’s books, and was very excited to get my tentacles on it. At the time there were only a couple images that teased at what the book would look like, but it was enough to catch my attention. Since then I have been watching its progress and patiently waiting for my copy to arrive in the mail. Signed copy in hand, I am happy to have finally received this amazing book! As I sat down to take a look at it my wife, who knows only a little about the Lovecraft/Cthulhu Mythos (We’re working on it), plucked it from my hands and began thumbing through the pages as I watched on. After a few giggles and Praises she said she loved it and could see herself reading it to our little one that is on the way. This of course slated my plans to brain wash my child to loving everything Lovecraftian, and it seems my wife just might be on board. Ian Thomas and Adam Bolton (who is enjoying this as his first publication) have brilliantly created an excellent addition to the Lovecraftian Universe. Where’s My Shoggoth? is a silly joy ride through H.P. Lovecraft’s Cthulhu mythos that anyone, adult or child, will enjoy. The book follows a young boy as he searches for his pet Shoggoth through creepy mansions and the damned grounds that surround it. Through the tale we encounter a plethera of Lovecraftian goodness and get to meet some interesting characters. Along with Ian’s seussian rhymes, Adam brilliantly illustrates the young boy’s journey and captivates the reader with minute details that brings cause for many re-reads. The book is a thick stock hardcover, making it very durable to thrashings from your joyfully insane child, and has a detail that I found very appealing. When I was a kid one of my favorite books was about a witch who flies on a broom for the first time and all the things she sees, it’s kind of similar to Where’s My Shoggoth? . And though I enjoyed the material, what really appealed to me was that it could glow in the dark. The pages of Ian and Adams book don’t have this capability, but I found it a nice touch that the cover is webbed with invisible luminesces so that you’re any little Lovecraftian will be able to spot their favorite book, like an unnatural color out of space, in the dark as they drift off to sleep. And when they wake up and might be slightly tired of reading, they can play the board game, Stairs and Tentacles, that is located on both the front and back cover. All in all Where’s My Shoggoth? has brought a modern appeal to children. Growing up in today’s world holds many visually arresting things. Video games are no longer only 8-bits, movies and TV are now in 3D, and books are now read on electronic devices. So how do you capture a child’s attention long enough to physically flip through pages of a book? You give them Where’s My Shoggoth? I know I am looking forward to sharing this with any who have kids and who love to read to them. If you are interested in this book, check out Ian and Adam’s website at www.wheresmyshoggoth.com. And if that’s not enough and you’re wondering how this book sounds, check out a free audio version at http://wheresmyshoggoth.com/audio/Shoggoth.mp3. And please visit both Adam and Ian’s official sites by clicking on their name anywher in this post, and see what there up to. One final note. With this amazing prize, I also received an amazing sketch done by Adam Bolton, along with a hand written note. It was very kind and I thank both Adam and Ian for sending me these goodies, and I hope to see more from these two in the future! In the sketch you’ll see the Unspeakable Gibberer that Steve Santiago created for me, playing chess with Adam’s Shoggoth. I’m not sure what struck me more, the amazing art, or the fact of seeing my creature playing with another from the mythos. Really cool! If you have checked out Where’s My Shoggoth? , let me know what you think. And if you like all the tasty bits we gibber about here, become a follower or submit to receive email updates with every new post! Don’t forget to check us out on Twitter @UnspkbleGibberr, and on Facebook at http://www.facebook.com/UnspeakableGibberer. This entry was posted on November 23, 2012 by David Joseph. It was filed under Books, Graphic Novel/Comics, Reviews and was tagged with Adam Bolton, Archaia, Childrens Book, Cthulhu, Cthulhu Mythos, H.P. Lovecraft, Horror, Ian Thomas, Where's My Shoggoth. How you like us now?